Given the barbaric and bloody attacks on Christians in the Middle East by the Islamic State and other terrorist organizations, it isn’t surprising that those same attacks are now occurring in the U.S. This weekend three Christian churches were vandalized with graffiti in Columbus, Indiana. They included Bartholomew’s Catholic Church, the East Columbus Christian Church, and Lakeview Church of Christ. Those involved in the attacks were clearly motivated by the sacred texts of the Quran. 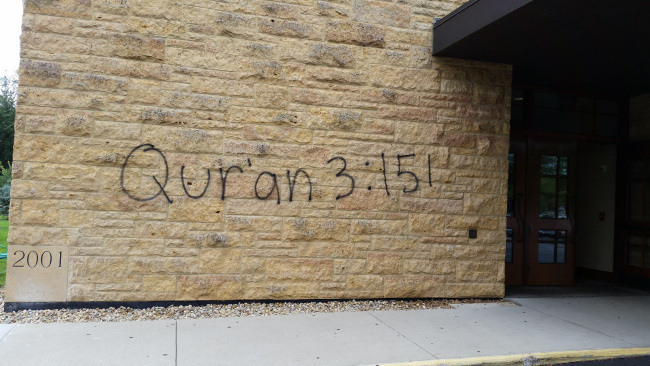 The Catholic Church was defaced with a huge spray-painted inscription – “Infidels!” This curse could be prompted by any number of passages in the Quran such as Surah 25:52: “Do not yield to the infidels (kuffar), but fight (jihad) them with this [Quran], most strenuously.” This particular passage goes on to say that Muslims and infidels are as separated as salt water and fresh water. The other churches were defaced with references from the Quran. One reference was Surah 19:88 which says, “Those who say: ‘The Lord of Mercy [i.e., God] has begotten as son’ preach a monstrous falsehood, at which the very heavens might crack, the earth break asunder, and the mountains crumble to dust.” This is the Islamic denouncement of the central pillar of Christian faith, the belief in Jesus Christ. The issue here is not that Christians and Muslims disagree over numerous points of theology and faith. The issue is that these agreements are now turning into criminal behavior – vandalism and making terrorist threats. Of course, Christian theology uniquely rejects all forms of retaliation per Romans 12:19, Matthew 5:39, and Matthew 26:52. However, Christians should not shy away from asserting the truth, not only from their own sacred text – the Bible – but also from the Quran itself. The Quran confirms that God willed for Jesus to be. Surah 3:58 says, “Jesus is like Adam in the sight of God. He created him of dust and then said to him, ‘Be,” and he was.” This is confirmed about Jesus once again in Surah 2:117, “When He (God) decrees a thing, He need only say, ‘Be,’ and it is.” Jesus is described in Surah 19:19 as endowed with virtue or purity (zakiyya). This description isn’t used for any other earthly person in the Quran. The Quran acknowledged in Surah 48:1 that Muhammad himself had “past and future sins.” Threatening Christians with terror for recognizing the higher position of Jesus in the eyes of God is unbecoming of Muslims. Churches that are under attack should place ads in the local newspaper asserting the facts and they should also work with the local mosques to have such vandalism and threats condemned in the mosques as well.